Did Shakespeare invent the comic book super hero? Hal, the dissolute, debauched young man who is disconnected from his family, but transforms into the all-conquering warrior Prince, may have always fitted that bill, but now even more so in Gregory Doran’s production, which re-enforces the image with the emergence of an over-the-top super villain. Trevor White’s Hotspur, with bleached blond hair, crazed for revenge, unpredictable and almost demented, would be the perfect opponent for Superman or Batman and he is the most original and striking feature of this vivid interpretation of what is, arguably, The Bard’s most thrilling play. Alex Hassell makes an affable, but lightweight Hal, more convincing in the taverns of Cheapside than on the battlefields of Northern England, but, in the context of an everyman thrown into “saving the World”, he is perfect. Jasper Britton is also excellent as the newly-crowned King, still uncertain of his grip on power after deposing Richard II so ruthlessly and constantly casting nervous glances over his shoulder. Of course, this is a play that is always there to be stolen by the actor playing Sir John Falstaff and, living up to expectations, Antony Sher is absolutely magnificent in the role, exuding all the charisma that would have drawn the wayward Hal towards him. Sher has distinguished himself in most of Shakespeare’s prominent character parts, but he has now become a brilliant physical comic, as seen when he first appears, emerging from under the sheets at the foot of Hal’s bed, just as two buxom ladies are departing, or when his rotund figure lies prostrate on the battlefield, faced with the near-hopeless task of rising to his feet unaided. Yet, for all the clowning, Sher captures perfectly the pathos of a once gallant knight, now sadly diminished by the ravages of the bottle. Doran’s direction focusses on the play’s traditional qualities, but his production is modern, crisp and quick moving, making full use of the uncluttered, projecting stage. Part II is usually a more difficult play, but it will be fascinating to see how this excellent company tackles it. Although Peter Duchan’s book for this 2012 American musical is actually based on a 1991 film drama, its story – three young US marines go out to enjoy one last night in the big city before setting sail to war the following morning – brings to mind Leonard Bernstein’s On the Town and, once that thought has become lodged in the head, everything that follows looks pale in comparison. Yes, that is an unfair way to view this show, just as it may be unfair to bemoan the fact that it falls below the exceptional standards set by Southwark Playhouse with recent musicals. Therefore, before going on, it is worth saying that there is much to enjoy in this production and, overall it is not really that bad, just flawed. The story is told in flashback – possibly a mistake as the first scene gives too much away. The setting is San Francisco and the date is 21 November 1963 – it is not clear why this is made so specific, as there is no strong connection with the world-shattering event of the day after. The Vietnam war is in its early stages and the marines have little idea of what to expect as they play their traditional game of “dogfight”, the offensive misogyny of which casts an ugly shadow over the first half of the show. 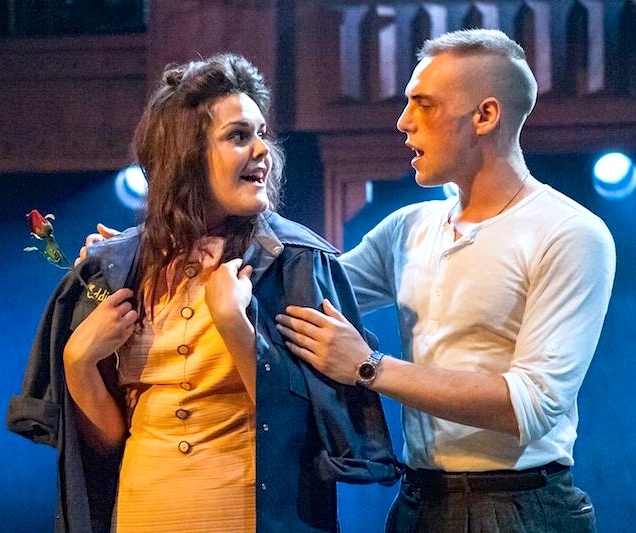 The game then leads on to a trite and predictable romance between one of the marines, Eddie Birdlace (James Muscato) and a waitress, Rose (Laura Jane Matthewson). Both leading performance are excellent and they get top class support from a company of nine. Individually, the songs by Benj Pasek and Justin Paul are quite pleasing, but they lack distinctiveness and variety, with the result that, cumulatively, they have a dampening effect, increasing as the show progresses. This feeling of a show that is always diminishing in strength is not helped, in Matt Ryan’s production, by most of the choreography being in the early scenes, leaving very little of it for a generally lacklustre second half. Dogfight is not a disaster, just a disappointment. St James Studio is more like a cocktail lounge than a 1960s-style folk club; gone are the smoke and the seediness, but it is here that the spirit of Guthrie, Seeger and Dylan lives on. 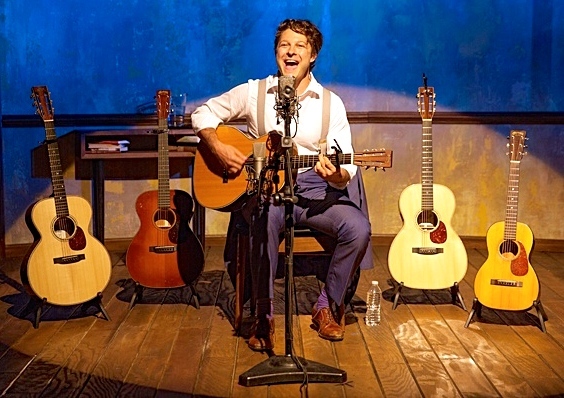 Coming from a privileged background, Benjamin Scheuer is perhaps more suited to this air of opulence; financial hardship and political activism do not influence any of his lyrics, yet the songs are heartfelt expressions of the pain and joy of living. This is a 75 minute solo gig in which Scheuer perches on stools and accompanies himself on six guitars (five acoustic, one electric), paying tribute to a father who instilled in him a love of music. “The Lion” is a metaphor for the courage to face life’s challenges head on and, here, Scheuer’s autobiographical lyrics take us through a troubled relationship with his father, an ill-fated romance and a battle with cancer. The storytelling is vivid and deeply moving and the music complements the words perfectly. Scheur’s voice is crystal clear, rich and mellow, with touches of gravel when the lyrics are at their most anguished. There is nothing new or earth-shattering here, but this show is exquisite in its simplicity and very close to perfection. The third of a trilogy of plays by French Canadian writer Jennifer Tremblay, The Carousel relates the stories of three generations of women, all seeking to come to terms with their links to each other and with their places on the carousel of life. A granddaughter speaks to her now departed grandmother who had seemingly cherished her sons, but rejected her only daughter, the girl’s mother; they rake over traumas in the family’s history and and they try to understand how these experiences will help the girl as she moves forward. All three characters in this superbly written but complex piece are played by the same actor, switching frequently from one to another, and this leads to difficulties in connecting with the narrative in the early stages. 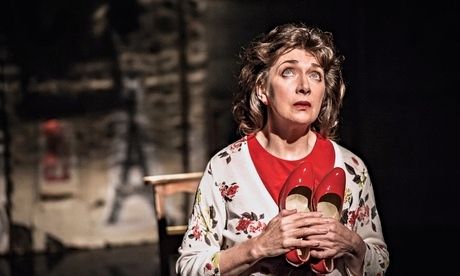 However, the emotional power increases as the play progresses, thanks largely to wonderful acting by Maureen Beattie. At this performance, Beattie stopped the play early on, because of an unexplained noise, informing the audience that she could not allow anything to interfere with the intense concentration which she needs. Once the play restarted, her reasons quickly became clear. This deeply moving play gets a true powerhouse performance. It’s Mardi Gras in August! This carnival of colour, high energy and rhythm is performed by a company of 16 dancers, weaving together lambazouk (lambada dance and zouk music) with other styles, celebrating primarily the culture of Brazil. The show is a collection of spectacular dance sequences, linked very loosely by a script, written by Pamela Stephenson Connolly, which tells of the quest by Braz Dos Santos to bring lambada to Europe. Brazouka does exactly what it says on the tin – it gives solid, undemanding entertainment and there is nothing not to like about it. 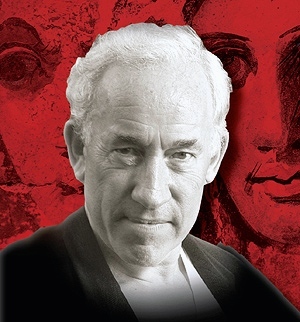 Simon Callow is the master of one-man shows dedicated to cultural icons – Shakespeare, Dickens, Wagner – but who has ever heard of Juvenal? Well, he was a scabrous satirist living in Rome around the 1st Century AD and this show is a collection of his writings, adapted by Richard Quick to give them a modern slant. A vulgar misogynist, he rants against just about everything that comes into his view, but mere rudeness is no substitute for wit and, sadly, the novelty of his outbursts wears thin very quickly. This show could be an uproarious success if performed as an after dinner entertainment for Oxbridge Classics scholars and Callow appears suitably dressed for such an occasion. A few of Juvenal’s observations are relevant to the present day, but the rest are all pretty obscure and there is far too much repetition. Callow’s flamboyant, actorly style is always a joy to behold, but, otherwise, this show has little to recommend it. 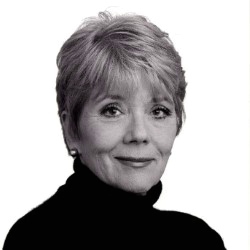 Dame Diana Rigg describes her one-woman show as “an entertainment”, but, for a budding theatre blogger, it is more a tutorial. Developed from her book of the same name, first published 25 years ago, Dame Diana’s talk relates to bad reviews given to herself and to fellow thespians over a period of more than 1,500 years, although she expands it to give a potted history of theatre. Much of the time she reads from a rather dry script (it is very tempting to write something really poisonous at this point in an attempt to get included in volume 2 of the book), enlivened only by occasional delightful anecdotes about “Larry”, “Ralph” and the like in her days as a walk-on – one of these, relating to Vanessa Redgrave, is as cutting as any critic could muster. Eventually, Dame Diana sets the script aside and becomes herself, a delightful, relaxed and witty lady. It is just a pity that she could not have done this earlier.